With food culture in the midst of a do-it-yourself renaissance, urbanites everywhere are relishing craft beers, foraged ingredients, sustainable seafoods, ethically raised meats and homemade condiments and charcuterie. 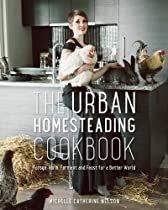 Inspired by the delicious creativity of local artisans, chefs, brewmasters and mixologists, Michelle Nelson began urban homesteading in her downtown apartment. Armed with a passion for food and farming, and a PhD in conservation biology and sustainable agriculture, she shares her hard-won knowledge and recipes with readers interested in collecting, growing and preserving sustainable food—even when living in an apartment or condo.In The Urban Homesteading Cookbook, Nelson explores the worlds of foraging wild urban edibles, eating invasive species, keeping micro-livestock, bees and crickets, growing perennial vegetables in pots, small-space aquaponics, preserving meats and produce, making cheese and slow-fermenting sourdough, beer, vinegar, kombucha, kefir and pickles. Nelson fervently believes that by taking more control of our own food we will become better empowered to understand our relationships with the environment, and embrace sustainable lifestyles and communities.With 70 fabulous recipes, including sesame panko-crusted invasive bullfrog legs, seaweed kimchi, rabbit pate with wild chanterelles, roasted Japanese knotweed panna cotta and dark and stormy chocolate cupcakes with cricket flour— this exciting new book is sure to inspire readers to embark on their own urban homesteading adventures.Generously illustrated with gorgeous colour photography and complete with useful how-to chapters, The Urban Homesteading Cookbook is an invaluable guide for all those seeking ethical and sustainable urban food sources and strategies.